2. The sizes of the rodscan be customized as your requirements. 3. Blank rods and polished rods can be chosen. 4. The minimum diameter is φd 0.025mm and the tolerance can reach to ±0.001mm. which showed uniform distribution of cobalt magnetic, high hardness and bending strength. 2. Inner structure are more compact and well distributed in metallographic test. JZ06U This tungsten carbide rod is with 0.4μm ultrafine particles and CO 6%. Be suitable for processing aluminum- magnesium alloy, glass fiber, carbon fiber, wood, hard plastic, etc. Recommend for making micro tools and drills. JZ08U This tungsten carbide rod is with 0.4μm ultrafine particles and CO 8%. Be suitable for processing resin, wood, titanium alloy, stainless steel, copper-aluminum alloy, composite material. Recommend making high speed drill, end mill, graver and micro-drill PCB with diameter less than 0.8mm. JZ12U This tungsten carbide rod is with 0.4μm ultrafine particles and CO 12%. Be suitable for semi-finishing and finishing process of stainless steel, mold steel and normal titanium alloy, etc. Recommend for making all types of high speed end mills, reamers and gravers. 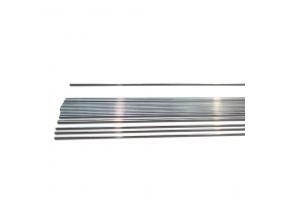 H6 Ground solid carbide rod. More H6 Ground solid carbide rod.